Here are two bloggers who know how to keep Christmas well. The handsome one in the green shirt is Mike Murphy, author of Smoke and Mirrors. The intelligent looking one on the left is your humble scribe. Michael shares my love of the traditional: fountain pens, leather backed volumes, pipes, and pocket watches enjoy a special place in his heart just as they do in mine, and there is something very Dickensian about working at an old tobacconist’s, where the sights, and especially the smells, can still transport you to another century. Nothing better during this Season than a pipe full of good leaf. I couldn’t agree more! Are you yourself a fellow brother of the briar? May your other-century world be filled with joy and happiness. Happy Christmas. And a (much belated) wish for a happy new year to you! goodness gracious, check out the gruesome twosome! and you had the nerve to call ~m & evyl the 2 headed monster??? Looks like Murphy makes up one half of more than one two headed monster! 😉 glad you liked the pic. This picture takes me back. I was brought up above the family newsagent, stationer and tobacconist’s. Cherished memories and smells are always with me. Hope you had a fine Christmas. Those smells stay with you forever, don’t they? Thanks for stopping by! Well, well, well. If I ever saw two faces that meant trouble, it would have to be these two! What do you mean? Looks, brains, and writing ability all in two hard-to-resist packages! What more could you want? Haha, very nice, very nice. 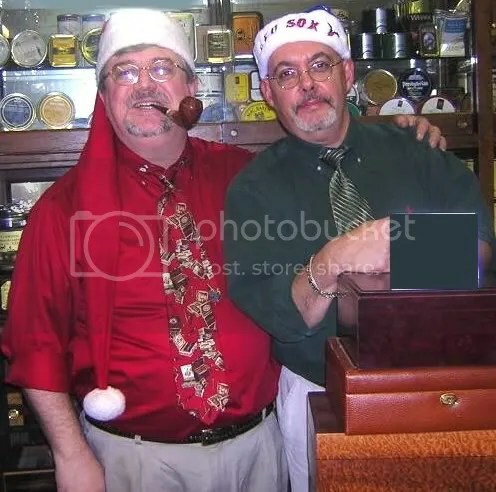 Thanks for sharing, now the only question that remains is who of these two men is Santa Claus? Me. I’ve got the belly. Love the picture! I love old stores like that. Whoa .. wait a minute. I missed this one! « …and god bless us, every one?